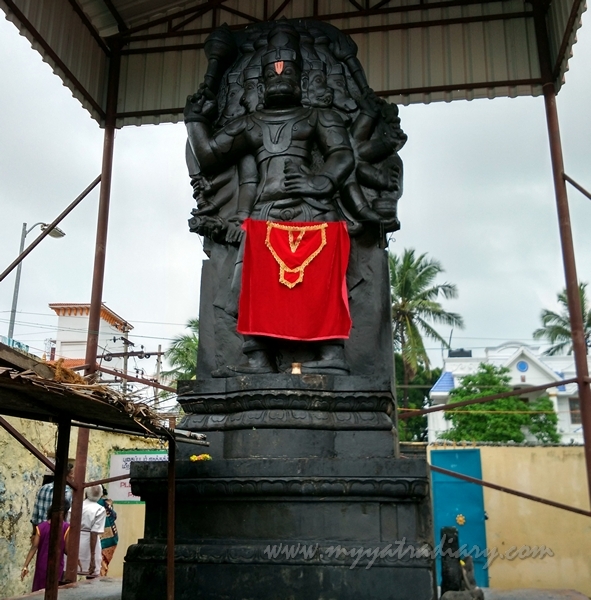 Places to visit in Rameshwaram: Floating Stones Panchmukhi Hanuman Temple. DAY 1: How to reach, where to stay in Rameshwaram | DAY 2: Ramnathaswamy Temple Darshan, Agni Teertham, Sunset boat ride | DAY 3: Places to see / Teerthas of Rameshwaram: Gandhamadana Parvatham (Rama Padam), Ghost Town: Dhanushkodi, Rama Teertham Extras: Rameshwaram Food Guide, Sweeping Healers of Rameshwaram Sea. What if I told you to imagine Lord Hanuman from the legends of Ramayana? Yes, that ardent monkey follower of Lord Shri Ram who followed Him in all His numerous trails. That powerful monkey God who brought an entire mountain when unable to locate a tiny medicinal sapling. That faithful servant who single handedly courageously took on an entire demonous unit led by monster king Ravana so that He could pass on a message to Mother Sita. That Hanuman who selflessly dedicated His whole life in the service of His beloved Master Lord Ram. How do you think that Monkey God Hanuman must have looked like? Let's get out from wherever we are for a few moments and step into the land of Ramayana, Rameshwaram to help our imagination! In Rameshwaram, a BIG deity of Lord Hanuman welcomes you right across the road, approximately 3 kms. from the Ramanathaswamy temple. Revered as the Panchmukhi Hanuman, here you meet Hanumanji in a slightly different avatar than across the other temples in India. Gigantic in height with 5 faces and 10 arms, He looks every bit of a "superhero" though as I imagine Him to be in the wonderful tales of The Ramayana. When Rama declared war on Lanka, the monster king Ravana took the aid of his demon brother Ahiravan, the king of Patal lok or the realm of the Asuras. Ahiravan misled Rama and Lakshmana into His kingdom with the wicked intent of killing them. Hanumanji soon sensed something amiss and set out to kill Ahirvan and free His Masters from the clutches of the demon. There was a catch here: Killing Ahiravan was possible only when someone extinguished 5 lamps lit in 5 different directions simultaneously. The great Hero that Hanumanji was, He manifested Himself as the five headed Panchmukhi Hanuman (Lord Hanuman, Lord Narasimha, Lord Adivaraha, Lord Hayagriva and Lord Garuda) and eventually succeeded in His endeavour. WHAT IS THE HIGHLIGHT OF PANCHMUKHI HANUMAN? A stone’s throw from the deity is a small temple dedicated to the Monkey God, also housing deities of Lord Rama, His brother Lakshmana and His wife Goddess Sita. One of the major highlights of this holy place is the exhibit presence of floating stones inside the premises. They were around 4 to 5 of them differing in their sizes, all of them floating on the surface of the water. These floating stones are believed to be the same stones that were used by Lord Rama to build the Rama Setu (Bridge) as He crossed over from Rameshwaram to Lanka. A must see architectural marvel if you are in Rameshwaram! Address: Ramanathapuram District, Rameswaram, India. Darshan or prayer timings: 06:00 am – 07:00 pm. Hanumanji Maharaj ki Jai. It looks such a rare Murti of Hanumanji, never seen like this one before. Hanumanji in black stone is very different from the Murtis we see generally. Also the story behind the Panchamukhi Hanuman shows His devotion toward Lord Shrirama to make all possible and impossible efforts to serve His God. Murti exhibits the very famous readiness of Hanumanji for the service of Lord Rama. His eyes always filled with Bhakti (reflecting in this Murti especially) inspires millions of devotees of Lord Rama. Thanks dear Arti for sharing the beautiful post. I saw this roop of His for the first time too, dear Mohini. You captured the "bhaav" of the Murti so wonderfully well. Thank you very much for complementing my article so beautifully with your soulful words. Your observation is spot on, Mareta. Generally, that's how He is portrayed in orange vermilion colours. This is a one of it's kind picture of His. Thank you for this story Arti. Never knew of Panchmukhi Hanuman despite being a devotee. He is indeed the epitome of loyalty and bravery. Seeing the floating stones temple must have been an experience in itself. Is this where they started laying floating stones from Bharat to Lanka? The story was new to me as well... It's very fascinating to watch these stones float on water. Goes against what we have generally seen and heard about stones as children... doesn't it? (of course there is a scientific explanation to these stones as well), but that's what makes it even more intriguing to me. Here it's just an exhibit but there's another very famous place called Adam's bridge or Ram Setu near Dhanushkodi - that is said to be the place where they actually started laying the stones. That's a lovely capture of the image of Lord PanchMukhi Hanuman. An interesting story indeed. I am yet to visit Rameshwaram. Will certainly remember your post whenever I will visit the place. Always love your blog for cool posts and information about travel.. thanks for sharing!!! Very great information you have provided here Art, never knew the significance of the Panchmukhi avtaar. Thanks for sharing. Very interesting tale of Panchmukhi Hanuman, Arti. I have heard so much about Rameshvaram. So many people say that these tales are mythology and that there is no real proof of these tales actually happening. What are your thoughts about this? To each his/her own, Rachna. I have my faith, my beliefs. People have theirs. Whatever the beliefs, they should bring us peace, that's more important in my view. Nice to learn of the Panchmukhi Manuman at Rameshwaram. We have a Panchmukhi Hanuman temple at Bhubaneswar too. We also have 108 Hanuman Temple- that's a temple with 108 Hanuman idols. Thank you so much, Anita! Never been to Bhubaneshwar but it would be such a great pleasure, I am sure :) The day when My Yatra Diary does plan to visit, I will not forget to pick you up on this comment and may be we could go to the temple together!! A unique avatar of Hanuman...glad that you drew the attention of your readers with this lovely temple replete with history...Rameshwaram does beseech all of us..
Nice post!There is a Panchamuki Hanuman near Mantralya also. Have read so much about Rameshwaran through your posts that I am indeed planning a trip down there soon. Hi! your description of the Panchmukhi Hanuman Temple was interesting to read. And the picture of Lord Hanuman's idol looks magnificent!